From September 4-7, the leading international maritime trade fair SMM will take place in Hamburg. This year’s theme is to discover what drives the maritime industry. Van Oossanen and Hull Vane will be present in a shared booth to showcase the essence of blue efficiency: optimising hydrodynamic performance. Optimising ship designs is essential in the process of creating sustainable vessels. We will display the very first scale model of the innovative Dutch harbour patrol vessel RPA-8, delivered in 2017 by Port of Rotterdam. In this project Van Oossanen and Hull Vane joined forces in realising the lowest fuel consumption and wave-making. RPA-8 is a hybrid-propulsed harbor patrol vessel built by Kooiman Shipyards and designed with the goal to minimise the fuel consumption, emissions and wavemaking. 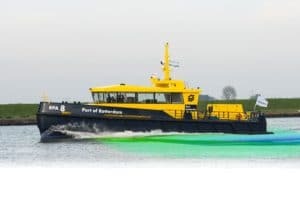 By combining Van Oossanen’s Fast Displacement Hull From with the “underwater spoiler” Hull Vane®, RPA-8 will consume 40% less than her predecessors for the same operational profile and generates only half the waves. The vessel is exceptionally quiet (always below 49 dB(A)), maneuverable, clean and efficient over the entire speed range. The hull of RPA-8 is completely different from the typical hulls. It has a CFD-optimised round-bilge hull with a shallow transom and it uses a hydrofoil – the patented Hull Vane® – rather than the hull shape, to generate hydrodynamic lift and dampen the stern wave. Model tests at Marin with and without the Hull Vane® showed a power reduction of 20 to 29% depending of the speed. RPA-8 marks a huge step in efficiency in a market segment where innovation has been going in small steps over the past decades. Are you interested to find out more about this Blue Efficiency? You are most welcome for a visit! Hull Vane and Van Oossanen will be present at B2.EG.118. If you wish to receive a free dayticket, please send us a message at info@hullvane.com!